Many shops nowadays are opting for the convenience and flexibility of pegboard displays. Pegboard shelving can be used in all kinds of retail units and for pretty much any light to medium weight products and are popular with stores including clothing stores, sports stores, chemists and newsagents. Here are a few suggestions on what you can do with pegboard displays. Pegboard units have a number of benefits which make them a suitable choice of shop fitting compared to other models. This is why you’ll see plenty of pegboard in Melbourne, Sydney, Brisbane and all across Australia. Flexibility – the main advantage of pegboard is probably its flexibility. You can use pegboard with shelves plus a wide range of accessories such as hooks and wire display baskets. The numerous holes on the panels mean that fittings can be attached anywhere, giving you a blank canvas on which to create a fetching display. Easy to use – units are easy to assemble and pegboard shelves and accessories easily clip in and out of place, meaning that you can rearrange displays in no time. Keeps stock well organised – whether you choose rows of shelving or a hangsell display, pegboard systems enable you to keep things neat and tidy and it’s easy to top up stock when things start selling. 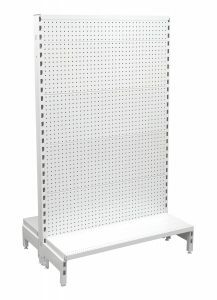 You can use gondola pegboard units to create aisles of shelving displays that customers can wander up and down. The benefits of using pegboard units are that they are lightweight yet sturdy, so are easy to move around the store – perfect if you want to rearrange. You can use traditional shelves for pegboard units to create neat rows of products, you can arrange goods by hangsell, or you can mix both styles on one display unit with this flexible system. Great for supermarkets, pharmacies, petrol station stores, hardware stores and more. Hangsell is becoming an increasingly popular way to display merchandise as it is browser friendly, neat and allows retailers to arrange stock with minimum fuss. Pegboard is arguably the best material for hangsell as the high number of perforations on the panels make them ideal for multiple display hooks so that you can maximise the amount of stock displayed. You can get various hooks, prongs and pegs for pegboard and can display anything from clothing accessories to packaged toys. Whether you’re a fashion store displaying shoulder bags or a DIY store hanging rows of packaged goods, hangsell can be an effective way of showcasing goods to shoppers. Gondola display units can also be put to use in store windows to market products to passers by both day and night. If you want to get a bit creative, then pegboard offers you the chance to design a tailored display, perhaps using shelving or display stands on the upper half of the unit to showcase goods at eye level, with a smart hangsell display lower down. Another useful shelving accessory for pegboard is slanted or angled shelving. This is metal or acrylic shelving that is the same as standard shelving except for the fact that it is slanted downwards at an angle, with a barrier or fence at the bottom to stop items sliding off. Angled shelving is perfect for flatter products such as books, magazines and newspapers as it means that products can be displayed facing the customer to give them more visibility. Not surprisingly, the slanted shelves are popular with stores such as newsagents, stationers and book stores. Many stores will stock unusually shaped or smaller loose items that pose the problem of “how and where do we display this?”. Display baskets and bins that can be attached as accessories to pegboard panels give stores the opportunity to save space on cumbersome dump bins placed on the shop floor. These attachments just clip into place and are available in different sizes to suit an array of purposes. Good for stores such as toy stores, discount stores, grocery stores and hardware stores. If you are looking to discuss shop fittings or retail shelving, call us on (02) 9608 5122 or email us at sales@shopfittingsdirect.com.au. Our shop fitting experts will be happy to discuss your requirements with you and advise you on your needs, whether that be for display stands, racks, counter units or shelves for Melbourne, Sydney, Adelaide, Brisbane or elsewhere. We are a Sydney based business but can deliver all of our products, from tower glass display stands to pegboard hooks, Australia-wide.